OnePlus 6 was launched to the world back in May this year in Mirror Black and Midnight Black colour options, followed by a Marvel Avengers Limited Edition variant as well as a Silk White Limited Edition model. But, it seems, the Chinese phone maker has plans to launch yet another colour variant in a shade of red as soon as July 2. The development was teased by OnePlus itself and could point towards the launch of an OnePlus 6 Lava Red variant. As is tradition, we could expect this edition to launch in India. In a video teaser on its official Twitter account, OnePlus wrote, “Now initiating: C61422. Do you wish to continue?” A simple Google search reveals that C61422 is, in fact, the RGB code for Dark Red. This almost gives away the upcoming launch of a red-coloured OnePlus 6 next month, on July 2. OnePlus India has shared the same tweet, indicating the India launch will be around the same time. Even tech YouTuber MKBHD posted a tweet that shows the silhouette of the OnePlus 6 red variant hidden behind the Midnight Black variant. While the RAM/ storage combination is currently not known, we could expect it to arrive in the 8GB RAM/ 256GB storage configuration, much like the recently refreshed Midnight Black variant. Price is also expected to be the same as the Midnight Black at Rs. 43,999. 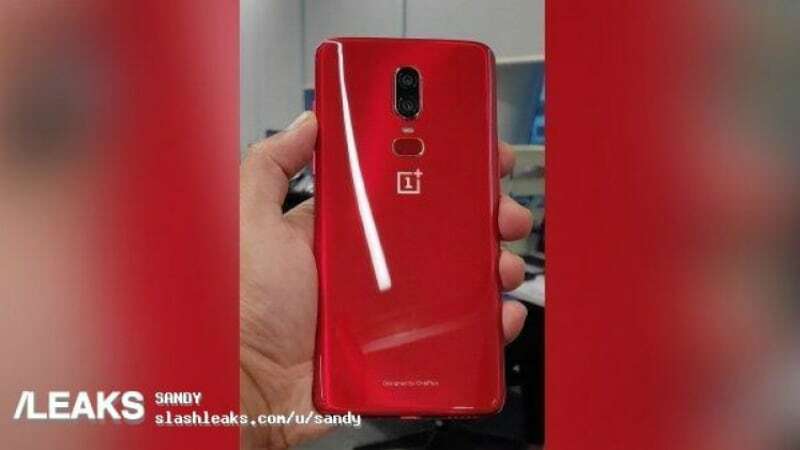 Separately, a live photo of what’s alleged to be the OnePlus 6 Red colour variant has been shared on Slashleaks. To recall, the OnePlus 6 is available in India in three RAM/ storage variants. These include the 6GB RAM/ 64GB storage model priced at Rs. 34,999, the 8GB RAM/ 128GB storage variant available for Rs. 39,999, and the 8GB RAM/ 256GB storage configuration priced at Rs. 43,999. Earlier this week, OnePlus announced its new Software Maintenance Schedule that promises two years of Android updates and three years of security updates for all of its recent OnePlus handsets. The schedule will apply to the OnePlus 3, OnePlus 3T, OnePlus 5, OnePlus 5T and OnePlus 6. The promise is valid starting from the phone’s respective launch date or month. OnePlus CEO Pete Lau also revealed that the 2019 edition of OnePlus’ flagship smartphone range will support 5G.